Smart Dublin, CONNECT Centre (TCD) and Intel have partnered to deploy low-cost sensors across Dublin to monitor rainfall, weather conditions and river levels. 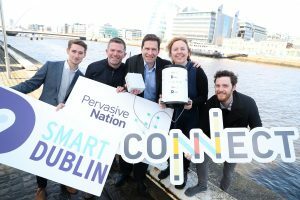 The new sensors will communicate data wirelessly to Dublin City Council’s operations team using CONNECT’s Internet of Things network – ‘Pervasive Nation’. Gerard O’Connell of Dublin City Council’s Flood Advisory Office believes that the pilot has the potential to revolutionise the rainfall and water level monitoring systems around the city, making the capital safer for its citizens and visitors. Flood damage to the city infrastructure ranges from €2m to €100m per annum currently, with an average of around €8m per annum, a figure that is increasing due to sea level rises and more intense rainfall events. “Dublin is emerging as a leading location for Smart City and Internet of Things (IoT) innovations. INTEL’s ‘Dublin Living Lab Programme’ has already carried out some initial flood monitoring activity across the city which has led to the prototyping of a set of river and rainfall sensors. Projects like this demonstrate how low-cost environmental sensor networks can be scaled to generate useful and actionable flood data for communities living across the city – Jamie Cudden, Smart City Programme Manager, Dublin City Council. The sensors are currently being deployed at several locations around the city including Ballymun Library, the Bannow Road Drainage Depot in Cabra, the storm overflow tank in Clontarf, and at the UCD campus in Belfield. The second phase of the project, led by the CONNECT Centre and Dublin City Council, will involve scaling these river and rainfall sensors to more locations around Dublin.